Raffaello Sanzio was born in Urbino, in the Marche region, in 1483 and died in Rome in 1520, when he was only 37 years old. He was painter and architect, one of the greatest of the Italian Renaissance. 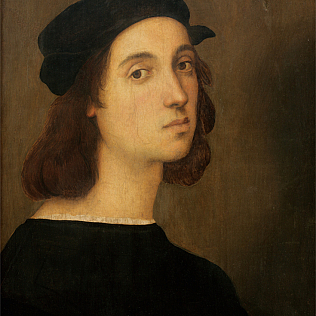 Son of the painter Giovanni de Santi, Raffaello probably learned from him the first rudiments of painting. However, his most famous master is Perugino (1448-1523), with whom he worked for about four years. Raphael spent a period in Florence, from 1504 to 1508. The young artist came to town because he was attracted by the fertile artistic and cultural atmosphere. In a short time, he received numerous private commissions and met many important artists. During the Florentine period some important works were made, such as the Madonnas series. Part of this series is the wonderful Madonna del Cardellino, kept at the Uffizi Gallery. The painting, very famous, returned to the museum in 2008 after a deep restoration lasting several years. In Florence, Raffaello made many portraits, partly preserved at the Uffizi Gallery, partly in the Palatine Gallery of Palazzo Pitti. The Uffizi also has a well-known self-portrait of the artist, dating 1506. In these works, Raffaello not only reproduces numerous naturalistic details, but captures the interiority and represents the character of men and women he depicted. In 1509, Raffaello went to Rome, to work for Pope Julius II, for whom he made some of his most famous masterpieces, such as the frescoes of the Rooms, in the Vatican City. In Rome, Raffaello died, when he was only 37 years old. He is still buried in the Pantheon. In the New Uffizi, one of the Red Rooms, the 66th, is dedicated to Raffaello.